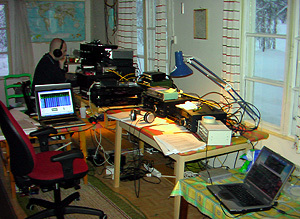 This was the first time that I spent the New Year DXing - perhaps not the smartest way to celebrate New Year. And propagation conditions were lousy. Anyhow, persistence paid off, as conditions improved gradually towards the end of the DXpedition. North America and Latin America eventually yielded stations relatively well, but we heard hardly anything from the Eastern hemisphere. In terms of equipment, software-defined receiver SDR-14 was used for the first time and was found to perform well in DXpedition use. I woke up at 7.45 in the morning local time on Thursday when it was still pitch dark in Vantaa on the southern coast. An hour later at 8.40 a.m. my wife's Voyager was packed and ready for the voyage of 1100 kilometers (700 miles) up north. The idea was to be able to drive as much as possible in daylight, which at this time of the year is a scarce resource. It got dark before Oulu, less than half way north. Driving conditions however were decent, and after service stops in Jyväskylä and Rovaniemi, I arrived in Lemmenjoki - without knocking down any reindeer - at 12:20 a.m. on Friday, December 30. Jari Ruohomäki, who lives in Oulu, had arrived already on Wednesday afternoon. His diet for the first 36 hours had consisted mostly of Latin American stations, his speciality. After a Christmas break it was unclear how much the antennas had suffered from heavy snowfall during the previous couple of weeks. A huge amount of snow had accumulated on trees, bending some birches almost 180 degrees, now pointing down to the ground. The antennas had however survived amazingly well, and we only had to free the wires of accumulated snow. 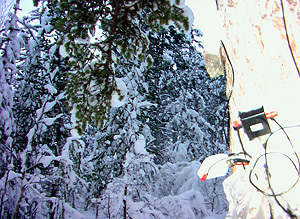 Wandering in the forest was starting to become a bit cumbersome, as there was about 40 cm of snow. 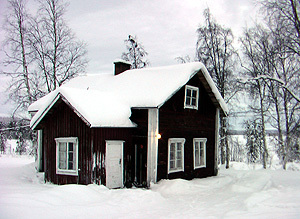 The weather was brisk, but bearable, with temperatures down to -25 Celsius (-13 F) during daytime at worst, and down to -35 C at night. The cold weather also revealed some electrical interference on the AM band, presumably caused by a faulty transformer in the neighborhood, but as soon as the local energy company Inergia sent men to investigate, the weather of course improved, and they were unable to trace the cause of the interference. Although conditions were not spectacular, there was enough activity on the dial to keep us busy most of the time. Overnight the emphasis was on South America, and from daybreak (though daybreak is a bit relative as the sun actually rises above the horizon only much later in January when kaamos, the polar night, ends) around 0700 UTC we would listen to North American stations as long as there was anything to listen to. For me it was very disappointing that conditions to Far East Asia were poor nearly every afternoon. We normally slept around 1700-2100 UTC and again in the early morning around 0300-0530 UTC. Starting midnight UTC Jari picked up decent signals from Brazil, with some stations also from Argentina, Uruguay and Chile all the way until 0500 UTC (some of the best catches being Radio La Amistad from Chile on 1400 kHz and Radio Folclorísimo from Argentina 1410 kHz). In the morning Canadians dominated over US stations, while not much else was heard during the daytime. Some Brazilians and other stations from the Southern part of South America were logged as soon as Mika got his gear in order around 0100 UTC (among the best catches was Radio Regional from Argentina on 1550 kHz). Hardly anything was audible from across the Atlantic around 0400-0700 UTC, after which US West Coast stations were heard in the upper end of the dial. Conditions were not exceptionally good, but we caught a couple of Californians (for example KHTS Canyon Country on 1220 kHz and KTKZ Sacramento on 1380 kHz) as well as stations from Washington later in the afternoon. US stations vanished after 1500 UTC, when we both nailed KWDB Oak Harbor WA on 1110 kHz after years of trying. Nothing from Asia aside from a few common Middle East stations. 2006 began with only the common Europeans dominating the AM dial. At 0115 UTC Brazilian stations came relatively well especially in the upper end of the dial. This continued for a few hours, until both the signals and we began to pass out around 0400 UTC. US stations (briefly along with a few Brazilians) were heard again from 0700 to 0900 UTC, when conditions deteriorated, and only a handful of the strongest US West Coast stations remained. So again we had ample time for sleeping and checking the antennas. In the afternoon, nothing much was heard from anywhere. European stations were really strong, with the first Spanish stations showing up already at 1330 UTC - of course on a day when there were no local breaks to listen to. Conditions began to improve, finally. The first US stations were heard already at 2115 UTC on Sunday evening, kicking off a 17-hour marathon DX session. In the evening, several stations became audible before their local sunset and a few continued past local sunrise, notably KWMG Auburn WA on 1210 kHz, which was identified first at 2320 UTC and last at 1659 UTC! After a lull before daybreak, we stayed put on trans-Atlantic frequencies until late afternoon, when Fiji (a new country for Jari) was heard on 1467 kHz. The last identified station was KELA Centralia WA on 1470 kHz at 1700 UTC, really late in the evening. At the same time Alaskan stations were heard with strong signals. Also CBC North was heard still at 1700 UTC on 1230 kHz, at the same time as CBC Iqaluit NU was already heard on the same frequency - so North American stations were literally heard around the clock. Conditions however didn't favor any specific region, which made it very difficult to find new stations. A few Japanese and other East Asian stations were heard briefly with decent signal levels around 1100 UTC, but very soon Europeans reoccupied the AM band. Because of the exceptional reception conditions of Monday evening, expectations for the night grew sky-high, but it turned out to be another mediocre night, with a bunch of weak stations mostly from the southern part of South America, including Radio San Carlos from Uruguay on 1510 kHz. Some US West Coast stations became audible around 0300 UTC, but generally overnight conditions favored the southern part of South America. After daybreak around 0700 UTC US East Coast stations were heard, while West Coast stations joined the crowd a couple of hours later. Again conditions were pretty general in nature, but it was nice to hear the AM band open up all the way to the lower end of the AM dial, even if only for a short time in the morning. At 1300 UTC the DXing day culminated with the logging of a few Mexican stations as the sun was rising in Mexico. The best logging was probably XETKR Monterrey NL on 1480 kHz. As usual, nothing much from Asia. Around 2300 UTC on Tuesday stations from the Americas started invading the dial. For the first time during our DXpedition we caught more than a couple of stations from Venezuela and Colombia. Bermuda was heard with BBC programming on 1160 kHz, along with the most common Puerto Rican stations. Overnight only a few US stations from the East Coast and Great Lakes were audible, but in the morning after 0700 UTC stations from all over the Americas were heard. For us this was a bit of a problem, because all frequencies tended to be occupied by the usual suspects, mostly from the Great Lakes area. However, a few decent catches were made before US stations vanished around 1300 UTC, very early in comparison with the beginning of the DXpedition. Once again only the most common Asian AM stations were heard in the afternoon, which was a disappointment. For once I decided not to keep a constant watch on the dial late Wednesday evening, and of course it was a mistake. A check at 2115 UTC turned out nothing, but we woke up again at 2230 UTC to find US stations in full swing. They continued for about an hour, leaving a slice of Easternmost stations on the dial throughout the night. However, a very pleasant surprise was to find the AM band filling with stations from the Northern half of South America, mostly from Venezuela, and continuing all the way until dawn. Our best catches from this excellent DX session include Peruvian Radio Lider, Arequipa (1240 kHz). In the morning at 0700 UTC, when all stations should have been booming in, the AM onslaught began to lose steam, though a few stations from Southern California strengthened and remained on the dial past midday, bringing some nice catches, especially KPRL Paso Robles (1230 kHz). The Great Lakes region improved again after 1100 UTC, and vanished well before sunrise, around 1230 UTC. Only some weak signals from the West Coast remained, while Asian stations continued to evade our receivers. Overall this was the best day so far, and signals were generally very strong - to the extent that instead of pre-amplifiers, nearly all the time I had to use attenuators with the software-controlled receivers. The first Brazilians surfaced from noise at 2145 UTC, and the first US station was WWKB (1520 kHz) at 2205 UTC. Later other South American countries became audible. Conditions however remained below average until around 0330 UTC, when Argentinean stations began gaining strength; the best catch being Radio La Morena de Itatí from Grand Bourg, logged for the first time on a new frequency of 1690 kHz (ex-1530 kHz). Around 0700-0800 UTC upper-band Brazilians made a brief comeback, ceding the band eventually to US stations. The graveyard frequencies opened better than before on this DXpedition, but otherwise signals were few and weak. 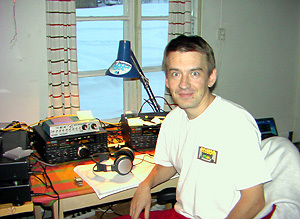 Around midday Jari was already about to pack his gear and head south, but luckily he stayed, because at 1130-1240 UTC we experienced an excellent DX session to North America. For a short while signals especially around 1000-1100 kHz and the upper end of the AM band were strong and clear, with stations from Minnesota down to Mexico, and it seemed like anything was possible. Our best catches include KLNG Council Bluffs IA (1560 kHz), KBEW Blue Earth MN (1560 kHz) and tentatively KCTA Corpus Christi TX (1020 kHz). The end was abrupt, leaving only a handful of West Coast dominants on the dial. Once again, only few stations from the Far East. I woke up at 2145 UTC on Friday evening, when the first trans-Atlantic signals were already audible. A refreshing change was to find a few Chinese stations around their sunrise. Otherwise overnight was mediocre. Conditions to the US seemed to improve in the morning, first there were some East Coast stations, and very soon also strong West Coast stations. We were both hunting for Californians, but we had to unplug the receivers just as things seemed to start rolling. Oh well, at least our followers Hannu Tikkanen and Håkan Sundman would enjoy great conditions. The cabin was unoccupied for a short period after midday, precisely at the time when stations from the Pacific islands would have been available - we heard this news later from fellow hobbyists listening to these coveted islands in Kongsfjord, Norway. How much unluckier can you get? We didn't do much aside from DXing and compulsory maintenance. On Tuesday evening we visited civilization; drove over to Inari for some grocery shopping, dining out at Kultahovi (excellent Kamchatka crab!) and checking our emails over a broadband connection at a local library. Returning to our cabin we found ourselves locked out. The lock was in pieces. Breaking in would have been the last option, but fortunately a neighbor from across the lake rushed to rescue, riding his snowmobile filled with tools, and fixed the lock in no time. Our equipment consisted of the usual array of beverage antennas, each 800-1000 meters long, and various communication receivers (2 x Drake R8B, 2 x JRC NRD-545, 2 x NRD-535, Winradio G313e, SDR-14). SDR-14 turned out to be a hell of a time machine when (rarely) conditions were really good, but on mediocre conditions traditional receivers were quite enough. 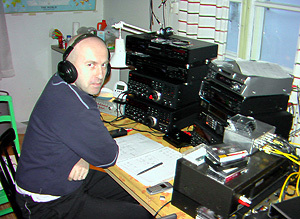 Software-defined receivers (at this stage especially SDR-14) tend to alter the practise of DXing during excellent conditions. Years ago, armed with just one receiver, I of course attempted to identify as many stations as possible live, but as the number of receivers grew to 2-4, it became more convenient to leave the most interesting frequencies to be recorded, and concentrate a more active manual search on some less promising frequencies. SDR-14 takes this development a step further by allowing an entire frequency range to be saved for further reference. This allows you to extend and treasure the listening experience in a way that was previously impossible. It also encourages you to explore new frequencies, and hopefully make new discoveries. The result is a DXpedition log, which initially is relatively modest, but tends to grow significantly once recordings are reviewed. This screen shot from Spectravue software (1345-1405 kHz) shows exceptionally good trans-Atlantic conditions. The strongest peak on 1350 is a pest from Latvia, but 1359, 1377, 1395 and 1404 are very weak, while trans-Atlantic signals are consistently strong. Comparing SDR-14 and Winradio G313e (see separate review on this receiver published earlier) was interesting; they are actually very different. SDR-14 is better in many respects; the 150 kHz wide recording option is just awesome compared to Winradio's 20 kHz. The spectrum display is better than in Winradio and can be tailored in many ways - I found it easier to interprete, and more comfortable to the eye. Recording multiple files of the same frequency range is automated and works well. The software (Spectravue) never had any problems, unlike Winradio. The attenuator has several levels, unlike Winradio, which only has one. Winradio G313e has its advantages though. Its unlimited memory capacity beats SDR-14, which has no memory channels at all. It is very frustrating to try to scan especially 9-kHz interval frequencies with SDR-14. Winradio's notch is good, while SDR-14 doesn't even have one. The timeline is much easier to work with, and the time code is shown constantly, unlike in SDR-14. Winradio doesn't overload as easily as SDR-14, which was very difficult to work with. In principle SDR-14 should indicate overloading on the screen, but the indicator only seems to work when overloading is really serious. In milder cases, you don't see any warning, and only find afterwards that the recording had been ruined. Setting the best attenuator level in SDR-14 requires constant trial (and error). During the first few days we had frequent blackouts, which caused problems especially with the software-defined receivers. 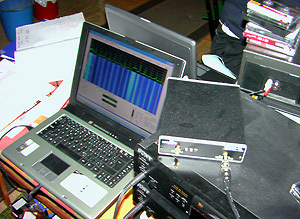 SDR-14 fared better, while Winradio not only lost the recording, but also often stalled and sometimes crashed the entire computer. For band scanning I still preferred to have a traditional table-top receiver, in my case NRD-545. Despite their annoying shortcomings, both software-defined receivers are however very useful in DXpedition use, especially when recording frequencies that are not constantly monitored or changed. 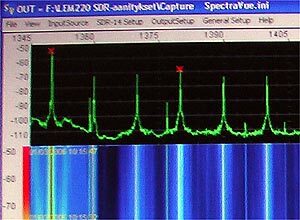 I often set Winradio aside for recording the graveyard frequencies of 1230 & 1240 kHz, while SDR recorded a 150 kHz wide spectrum, often around 1360-1500 kHz. To minimize overloading concerns, I tried to avoid including the strongest nearby pests such as Finland's YLE on 558 & 963 kHz, Norway's NRK on 630 & 1314 kHz, Russian stations on 549, 918, 1134, 1260, 1449 and 1521 kHz, and RTI from Latvia on 1350 kHz. NRK 1314 kHz is the worst station of all, much of the time destroying any chances of picking up stations on 1310 or 1320 kHz. A note about the spectrum display; it really reveals and demonstrates what bandwidth-sucking monsters DRM transmitters are. DRM stations effectively ruin everything around them. You can't escape DRM interference even in a distant location like Lemmenjoki. DRM interference was worst around 1296, 1440 and 1485 kHz. All good things come to and end, even DXpeditions. The 15.5-hour drive up north was manageable when I had a DXpedition to look forward to, but after a week of sleep deprivation, taking the train down seemed a wiser alternative. However, I couldn't resist the temptation of listening as long as possible, so the last receiver was unplugged only around 11:40 a.m. on Saturday. I managed to leave at midday, and for a while I thought that I was in danger of missing the train, so I hurried to Kolari in three hours - early enough. Jari headed home a bit later at a more relaxed pace.